Choose your dream wedding cake from our show stopping collection of wedding cakes for 2017 or have us create a beautiful bespoke wedding cake especially designed for your special day. At Sugarbliss Cake Company, Solihull, we’re sure you’ll find the perfect wedding cake for your centrepiece to complement your theme. Choose from over 50 plus cake flavours from a traditional fruit, to delicious sponge and chocolate varieties. Our stunning new wedding cake collections range offers something elegantly different for your wedding. All Sugarbliss cake company wedding and celebration cakes are freshly baked in our ‘Sugarbliss Cakery’ using the finest ingredients. Plus you can order a taster box to help you make your mind up before ordering your beautiful cake. You can also choose different flavours for each tier to ensure all you guests are catered for. If you have an allergy or a dietary requirement and would like us to create your wedding cake, please contact us, as we also specialise in eggless wedding cakes, gluten free wedding cakes, sugarfree wedding cakes and vegan wedding cakes. Ordering your dream cake is easy at Sugarbliss cake company. You can simply visit our Cake Decorating shop in Knowle, Solihull, where our friendly staff can give you advice regarding your wedding cake design, or call us to discuss and order your wedding cake by phone or online. Our cake shop is open Monday to Saturday from 9.30am to 5pm. 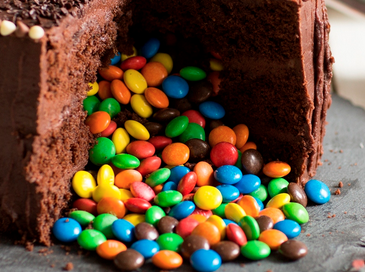 Our surprize fillable cakes have been great fun and very popular this year. Whether, for a wedding cake or a birthday cake, these fun cakes can be filled with so many different treats and really do create a surprize when the cake is cut. Choose from a wide selection of fillings from smarties, candy sweets to chocolates and popping candy, to create your very own favourite surpize in side! Our delicious ‘Surprize In Side’ cakes are also available in all our sponge flavours and are also available in our delicious and popular, Eggless cakes and Gluten free cakes. Our wonderful filled cake designs can be created in any of our bespoke cake designs from a traditional designed birthday cakes to stunning colourful rainbow celebration cakes and wedding cakes! We are really excited as our new bespoke wedding cakes collection for 2017 will be on display at the Asian Wedding Show March 2017. Our new stunning Wedding Cake collection will also be available for all to see at our cake Decorating Shop, Knowle, Solihull. Here at Sugarbliss Cake company we love Creating beautiful, elegant and stylish bespoke Wedding cakes, Cupcakes and Dessert Tables for wedding and celebrations. Our new wedding cake collection is available in all our fantastic and delicious cake flavours and filling all freshly baked in our Sugarbliss Bakery. Our wedding cakes are also available in our eggless, gluten free and vegan flavours. We have also added a range of wedding cake flavours which are filled with treats inside! New in our cake decorating shop, Solihull, West Midlands is a range of Edible sparkly Jewels which are available in different colours from diamond to ruby. 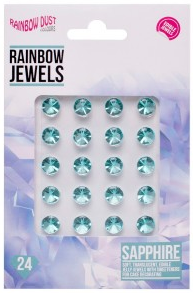 Rainbow Edible Jewels are soft translucent edible jelly jewels for cake decorating. A pack of 24 Rose Pink, edible jelly gems manufactured by Rainbow Dust. They are great on sugar paste and buttercream and ideal for all sorts of sparkling food decorations. Perfect for weddings cakes, anniversaries, birthday cakes, engagement cakes and sugarcraft. They are also sweetened and have a great flavour! To apply to sugarpaste, wait until the icing has fully dried out, then stick using liquid glaze. The jelly gems are best chilled for a while before using to help firm them up. Should you blemish them while applying simply rub with a little vegetable oil to remove marks.